After the promising performance increase we had in Hockenheim, it was decided that in order to increase our chances of a good performance at the European Finals any opportunity to test would have to be taken. 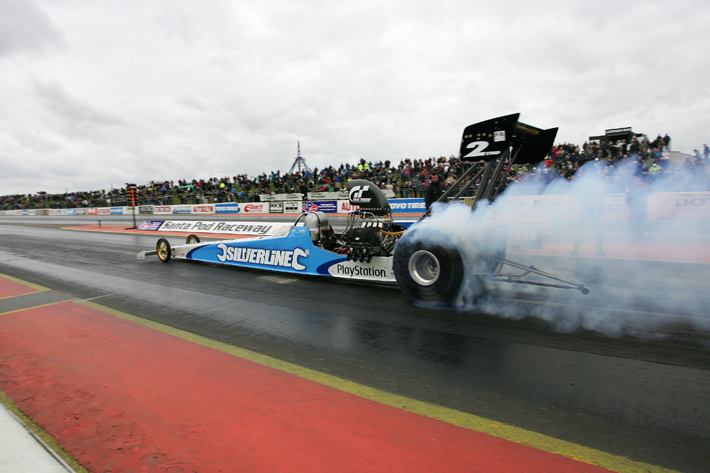 So, Sunday 5th September found us at Santa Pod for the “Peak Performance Practice Day” one week before the final race. After our runs in Hockenheim we could see that the performance in the early part of the run was down in our 60 ft and 330 ft times, therefore the object today was to work on the start line and short track performance, so only half track runs at most were needed to do this. Not only is it easier and quicker to do the maintenance between runs but it also saves money and possible engine damage and still gives the data and times we need. Well the first attempt resulted in smoking the tyres instantly at the hit of the throttle, possibly we had overestimated the track and needed to be a little less aggressive with the engine and clutch settings. The second attempt was much better .995 @ 60 ft, exceeding our best 60 ft in Hockenheim. Wednesday 8th September “Pro Peak Performance Day” and our next opportunity to do some testing. The day did not start off too well !! After the warm up when checking the valve lash I found some of the locking screws retaining the rocker shafts were broken. As they had only been replaced a week ago they must certainly be defective, so the decision was made to replace them all with the previous ones. Not an easy task as the broken bits were stuck in the rocker stands. However, with some effort and some help from Pete and his Tig welder ( from Bert and Andy’s team) we got them out and sorted ready to make a run at 1 o’clock. First pass of the day for us and a very satisfactory improvement, again an early shutoff before 300 ft and an improved 60 ft of .987. After maintenance and further adjustments we came to the line again at 3.30 pm. This time I stayed on the throttle a little longer, just under 3 seconds, now the 60 ft is better again at .962 and the 330 ft time 2.46 equated to at least a mid 5.30 if it had been a full pass. So far as testing was concerned that was mission accomplished, no damage and a much improved 60 ft time, .962 compared to our best in Hockenheim .999. Overnight rain of almost Biblical proportions did its absolute best to wash any track prep and rubber away that had been so carefully applied by the track crew earlier in the week and during the first day of Sportsman qualifying, but as you would expect from them they carried on drying and preparing the track even through the drizzle which lasted most of the morning. The rain finally stopped around 12 o’clock and by 2 o’clock the qualifying could begin with TMD quite a way down the running order of classes which meant we came to the startline around 5 pm, by which time the wind and the cold had quite an effect on everybody and the track. The track was surprisingly good due to the track crew’s ongoing efforts and it was a great pity we did not take advantage of that!! The run was doomed before I hit the throttle, an incorrect fuel system setting on the startline restricted us to a very lazy 5.97 @ 234 mph, not the result we wanted and all my own doing. However, no damage or problems after the run in spite of our incorrect setting gave us food for thought, so maybe every cloud does have a silver lining!! A bright and sunny start to the day and on our second qualifier no mistakes, we go from zero to hero for once with a 5.48 @ 258 mph which makes us number one qualifier at that point, but there is so much more performance in the car if only we can figure out how to use it!! Next qualifier we turn the power up as it’s our last qualifier and we are now in number 3 spot. We want to see what the track can hold, but we overestimate again resulting in instant tyre smoke and a final qualifying position of number 5. So we now knew what was needed to run 5.48 and also what is too aggressive a setting and in the first round tomorrow we will have to try to take the weather and track conditions into account and find a setting in-between the two which will work better. 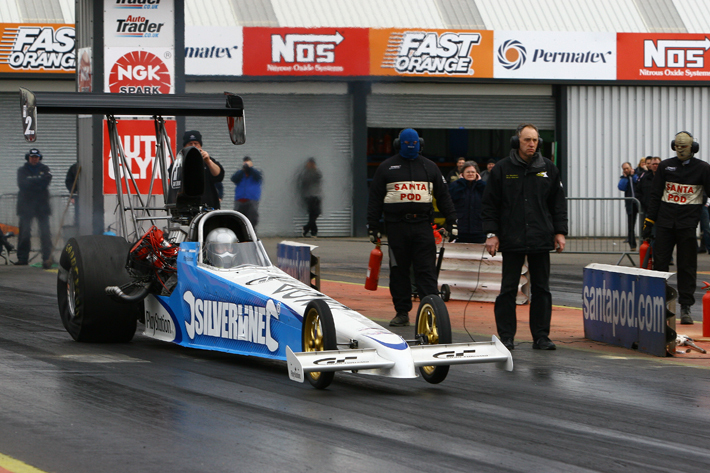 Due to our qualifying position we race Peter Schofer in the first round. We have raced each other many times over the years and usually our reaction times are similar, so the car with the best performance on the day is probably going to win. As Peter qualified with a 5.47 against our 5.48 and we know both cars are capable of running as good as low 5.30’s on their day, it really is anybodies race. And so it was all the way to the finish, Peter slightly ahead on reaction time and us slightly ahead on performance. Result we win by 16 inches. However it did not come without cost. When we return to the pit we know the engine is hurt. First we remove the cylinder heads and sure enough four pistons are damaged and we decide we can repair that. 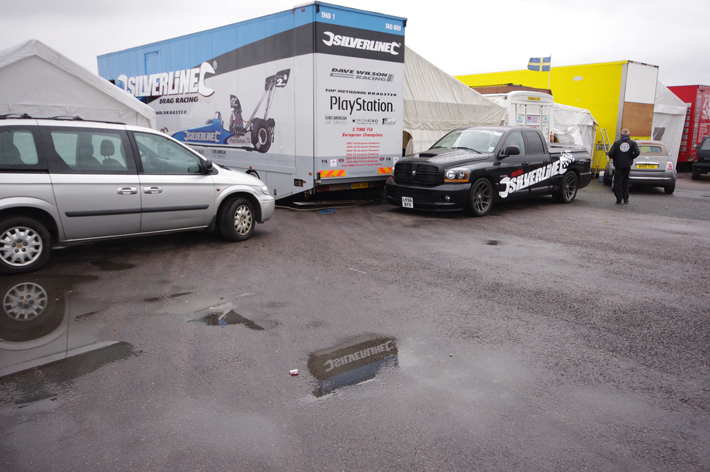 We have spare pistons, liners and cylinder heads in the trailer courtesy of our sponsors Silverline Tools and PlayStation. Then we discover that the engine has also broken all the bolts on the starter coupling. As we had already started on the repairs to the engine, I take the starter coupling from the spare engine but find I can’t fit it due to parts of the broken bolts being stuck in the crank! At this point we have to change our plan to repair the engine and fit the spare instead. By now we are way behind getting ready for the semi final run but our opponent is also in trouble and having to change engines so all is still to play for (this is when races can get won or lost in the pits). The crew are putting maximum effort into the repairs and engine change. We have all practiced doing this and if we had not attempted to repair the first engine we would be finishing off by now instead of continuing with maximum effort on what seemed a hopeless task, and then spots of rain begin to fall! Maybe we will get more time giving renewed energy and urgency to our efforts. Then the rain stops and shortly after our opponent towed by with his crew literally sitting on the engine still bolting parts on!! We still carry on, anything could still happen! 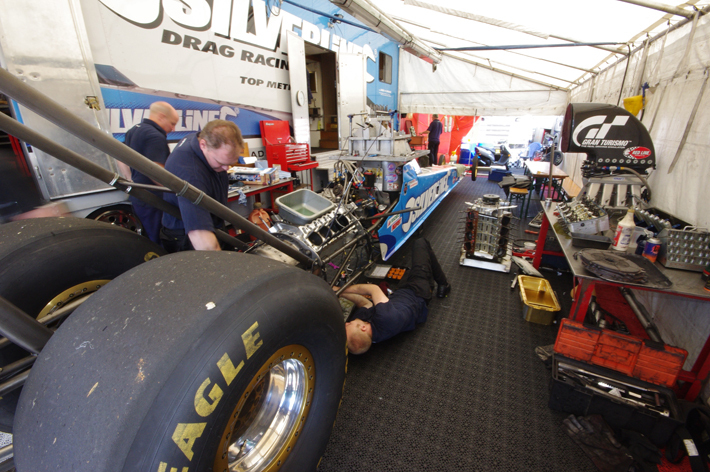 But as we are fitting the cylinder heads the first pair of cars fire up for the semi finals, but still we carry on as if one of the cars should oil the track or it should start to rain again, we could still make it. The first semi final runs without incident and the order is given to fire up the second pair. Now and only now do we all down tools. But there is still another sting in the tail for us!!! Our opponent who is on the start line cannot get his engine to fire up due to an ignition problem, probably caused by the rush to get his engine changed. So if we could have got there with any cylinders firing we could still have won the race!! You make your choices, whether its tune ups or engine changes. It sometimes will make the difference between winning and losing. Obviously it wasn’t our day! But on the up side the weekend saw an increase in our performance which with a few further small adjustments would see us back to the performance levels we enjoyed a year ago. But we have seen a number of modifications to different areas of the car work very successfully, the benefit of which will show when we get our tune up back on track. 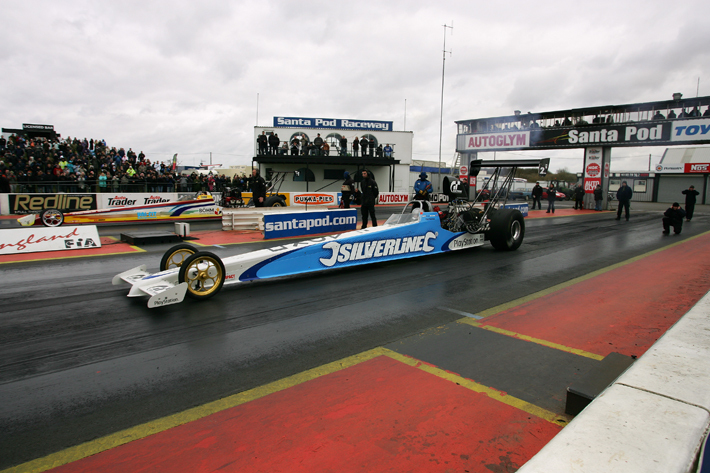 We will not be at the National Finals race as we have a prior appointment with our sponsors Silverline Tools. 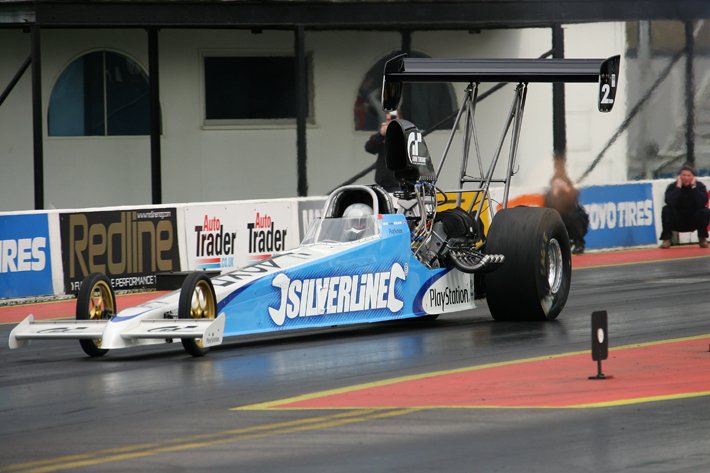 They have a Power Tool Drag Racing event at the Fleet Air Arm Museum in Yeovil where we will be on display, running the dragster engine at various times and racing their Silverline Tools entry, the Silverline Tools trike. 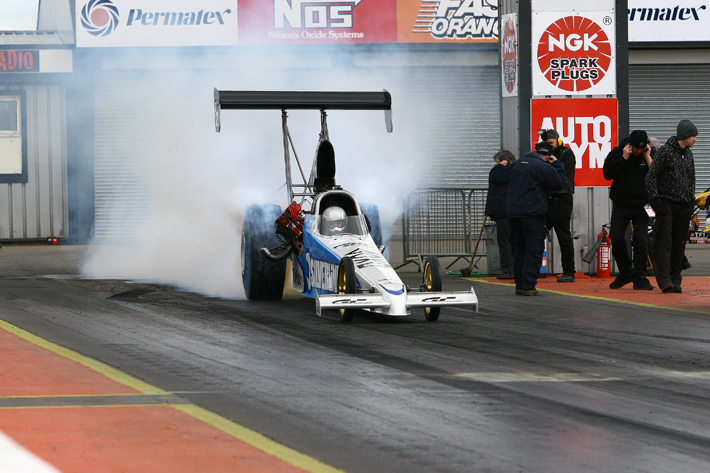 Our next race will be Easter 2011 where after a winter of research and preparation we hope to exceed all our performances this year.